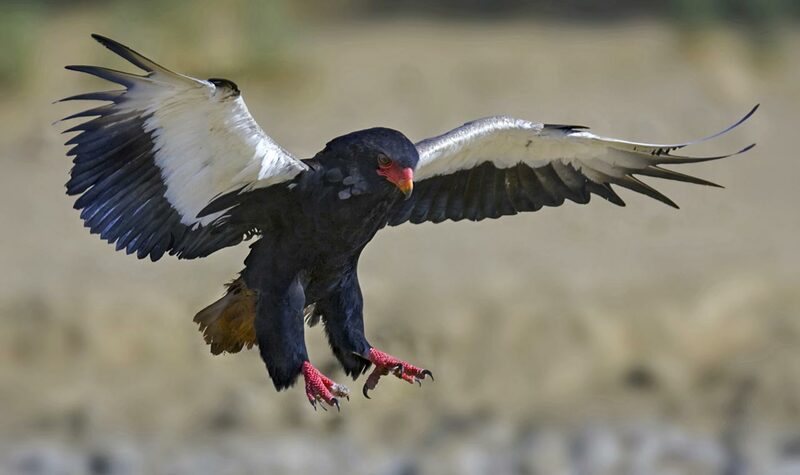 One day, someone watching an eagle in spectacular flight exclaimed “Bateleur!” The bird that earned that name (which is French for “juggler” or “entertainer”) sometimes summersaults as it flies, gliding side-to-side and covering up to 300 miles ( 483 km) in its daily, eight-hour search for food. What percentage of bateleur chicks reach adulthood? Only 2 percent of bateleur chicks reach adulthood. 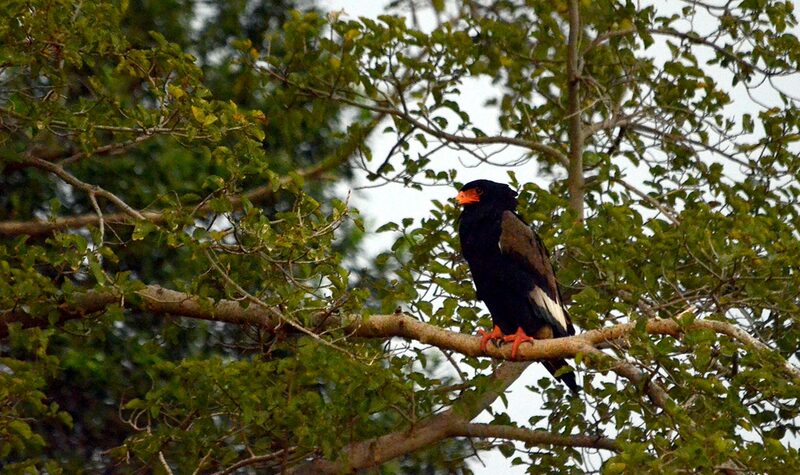 Usually silent, a bateleur will rear back its head and let out a loud schaaaa-aw during courtship or when stirred up. Though bateleurs are usually found singly or in pairs, they sometimes perch in groups of more than 20 birds. ​Human activity—trapping for trade pollution, and habitat destruction—is the main cause for the decline in bateleur populations that has led to its listing as near threatened by the International Union for Conservation of Nature (IUCN). They also die from eating poisoned carcasses that people set out to kill lions and jackals. Bateleurs hunt on the wing for small mammals, eggs, grasshoppers, carrion (especially roadkill), and snakes, which seem to be their favorite food. During breeding seasons that vary in places and times, a pair of bateleurs establishes and defends its territory while building a nest in the fork of a tree, using twigs lined with leaves. The female lays one egg and incubates it for 52 to 59 days while the male guards the nest and feeds his mate. The hatchling takes from 93 to 194 days to fledge. The chick’s parents allow it to stay in their home territory for a few months before forcing it out. Only 2 percent of chicks reach adulthood, probably due to predation. People trap and sell bateleurs primarily for their feathers, which are used for cures by traditional healers. 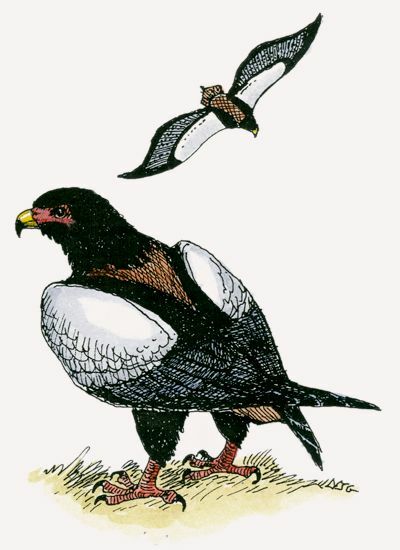 Bateleurs are found throughout Kenya. Bateleurs inhabit most of Africa south of the Sahara. They live in open country, including grasslands, savanna and sub-desert thornbush from sea level to 14,700 feet (4,500 m), although they are generally found below 9,800 feet (3,000 m). Fledgling bateleurs have longer tail and wing feathers than their parents to give them added stability and control while learning to fly. Each year as they molt, their new feathers grow in shorter than before. It takes between five and eight years for a bateleur to fully mature and have the long, narrow wings and short tail that make this eagle so easy to spot.